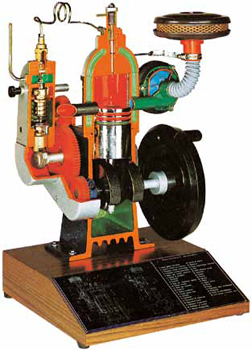 The most rational training model of a 2-stroke diesel engine sectioned for training purposes. Direct injection, complete with injection pump, injector, volumetric compressor, cooling system, etc. In order to simulate the active stage of the cycle a small bulb lights up during the expansion phase.